As outdoor writers and photographers, it’s time for us to be honest about the realities of environmental destruction – and how these realities affect the mountain landscapes we love. Think of an image depicting the Swiss Alps. Chances are, you’re visualising a gorgeous scene of the Matterhorn, perhaps rising above a meadow of wild flowers, maybe reflected in the still waters of a pool at dawn. The Matterhorn is a dominant visual motif in popular Alpine imagery. But how accurate is that depiction of an unspoiled natural mountain environment? And as photographers, is it our duty to tell the full, uncensored truth? I first visited the Swiss Alps in 2007. I wasn’t a photographer then – I came to the mountains as a climber, a passion that slowly morphed into a love of landscape and mountain photography. But I remember feeling puzzled at the disconnect between reality and my expectations. 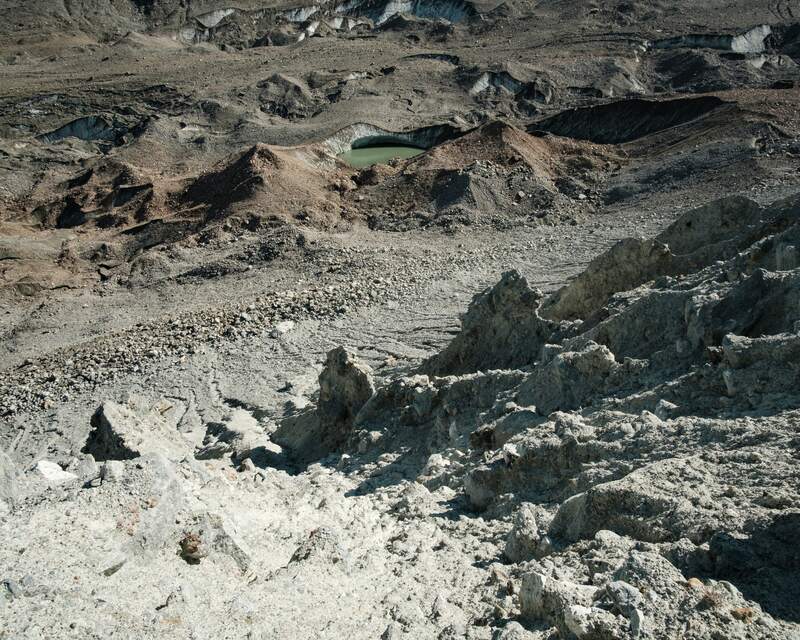 Almost every image I’d seen published of the Swiss Alps portrayed pristine, beautiful desolation – or, at most, a minimal human footprint on the land. A quaint wooden chalet or cobbled street leading the eye over the rooftops and back into the mountains. The reality I saw was quite different, and yet perhaps no different to any other mountain landscape. Switzerland is a developed country, not a wilderness. Humanity’s presence is everywhere – even if landscape photography rarely embraces that presence to its full extent. The same can be said of the Lake District, the Scottish Highlands, or even Iceland. But it was only when I returned to the same spot a decade later, in 2017, that I comprehended the true scale of this reality gap in the Alps. On an intellectual level, I knew that climate change was affecting the Alps, that glaciers were in retreat, but there’s nothing like seeing it for yourself to drive the point home. When I returned to Zermatt in September 2017 and revisited some of the climbs I’d done 10 years before, I was shocked at what I found. It was interesting to see how my perspective had changed. This trip was all about revisiting old haunts with a photographer’s eye; I found myself noticing details I’d never seen before, such as how difficult it is to compose an image of the mountains at the head of the valley without ski infrastructure intruding in the frame. Mostly, though, I noticed how depleted and skeletal the glaciers looked, the crumbling and eroded banks spilling debris onto the ice below. Views that had gleamed white in 2007 looked dirty now, blackened by rockfall. I climbed Stockhorn (3,520m), the highest point of the long, rocky ridge extending east from the Riffelhorn with unmatched views of all Zermatt’s 4,000m peaks. On my 2007 ascent with my brother James, we’d walked on snow much of the way along the ridge; now all was rock except for a final, anaemic strip of glacier just beneath the summit. In the vast basin of the Gorner Glacier far beneath, I saw seracs (ice towers) collapsing, and meltwater rushing through channels. 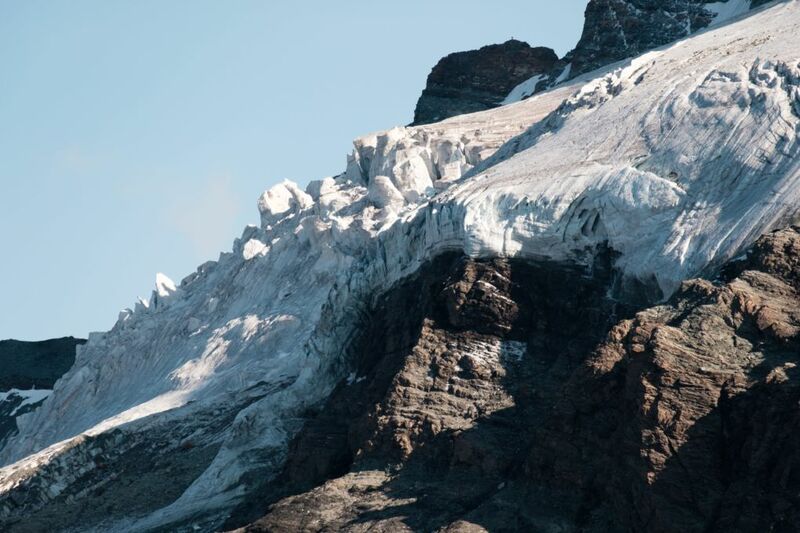 Monte Rosa’s ice-draped west flank looked a lot more bare than it had been 10 years before. Acres of rubble gleamed like bleached bone in the heat of the afternoon sun. I’d packed my bivvy gear along with my camera and tripod, and was looking forward to spending the night right on the summit – despite a frisson of anxiety that a thunderstorm would roll in from Italy and force a hasty and dangerous retreat. The dusk and dawn light shows were incredible, and I filled a memory card with images of alpenglow and drama, but even as I was capturing these images I could hear the boom of collapsing seracs as erosion continued to happen right before my eyes. And I wondered if these images I’d been so eager to capture – images that told a story of pristine natural beauty – were a lie. 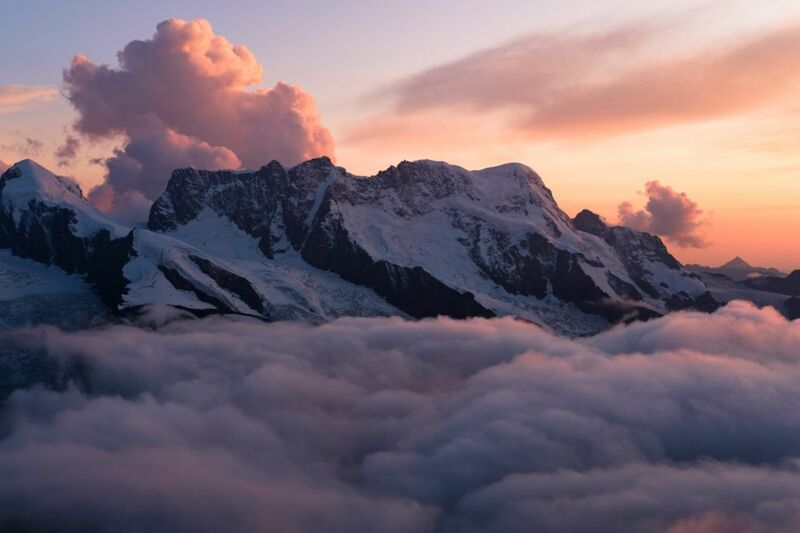 Like most glaciated areas worldwide, the Swiss Alps are in meltdown. 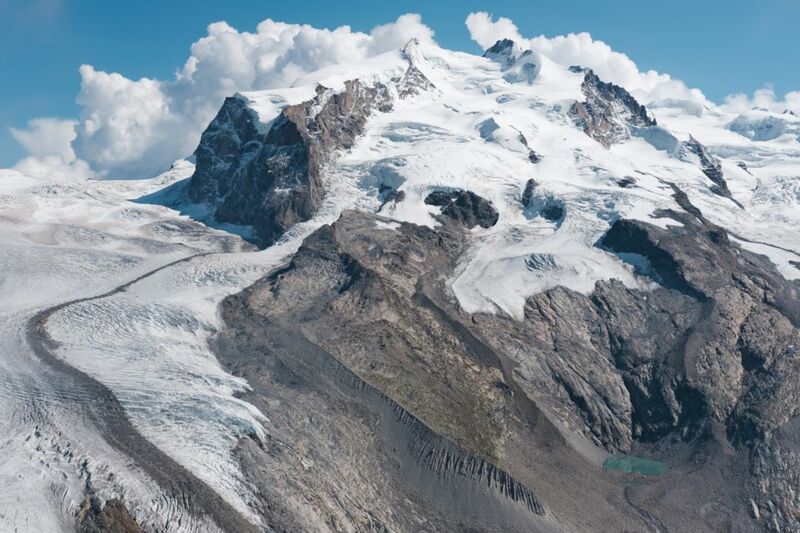 Almost every Alpine glacier is losing mass. The Grosser Aletsch Glacier, Switzerland’s longest, retreated by 2.8km between 1880 and 2009 (and the rate of retreat has accelerated since 1980). 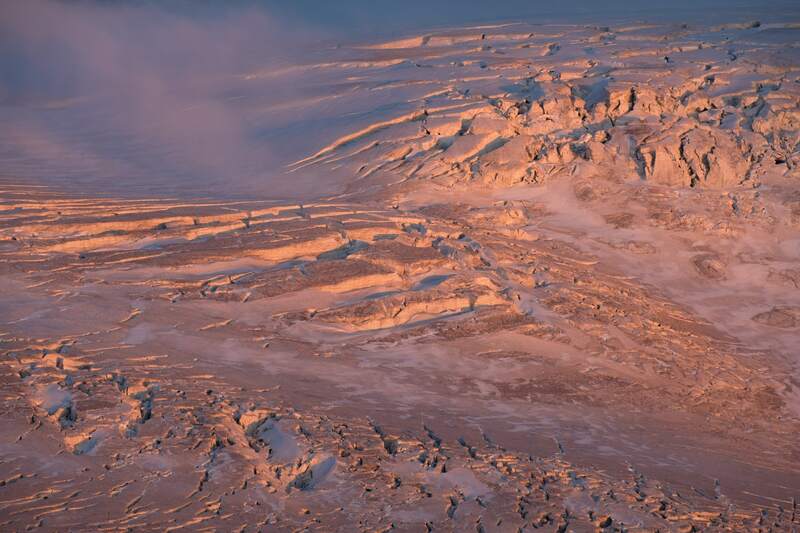 The Trift Glacier lost an astonishing 350m of its total length between 2003 and 2005 alone. Everywhere you look, glacier snouts are crawling back uphill and ice levels are dropping. When a glacier shrinks, its steep banks lose support and often erode rapidly, dumping more material on the surface. While a pristine white glacier reflects much of the sun’s energy, a dark, debris-covered one absorbs more of it (known as the albedo effect). There’s evidence that deposits of black soot from industry have hastened melting since the 19th century. 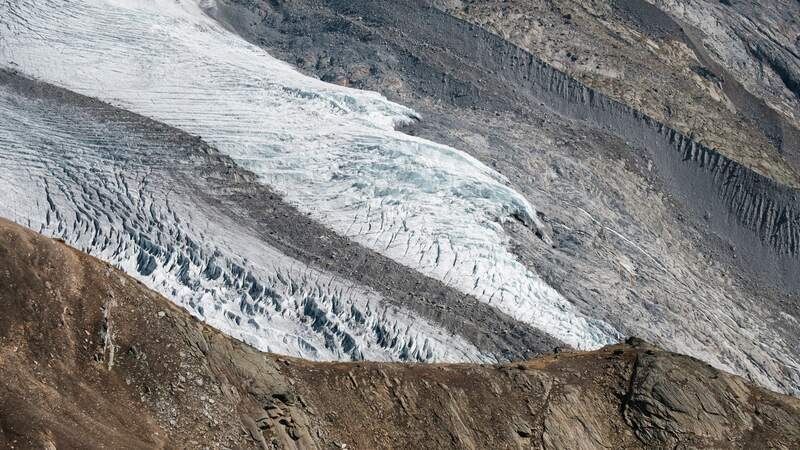 And now, with most Swiss glaciers decades into retreat and blackened with surface material, further acceleration in the melting process seems likely (although it’s important to note that deeper accumulations of debris may actually insulate and protect the ice). On my way down from Stockhorn’s summit, I passed the Riffelsee. This high Alpine tarn offers a classic view of the Matterhorn and is a popular tourist destination in its own right. Dozens of people were walking about and clambering on the rocks nearby, enjoying the crisp mountain air, taking selfies, and marvelling at the scenery in all directions. The sheer number of images taken at this location (and instantly shared on social media in most cases, thanks to the excellent 3G service) must be staggering. I saw several photographers there amongst the day-trippers, moving their tripods back and forth, some clearly frustrated by people wandering into their view. Despite the daytime crowds, it’s pretty good as photo locations go. 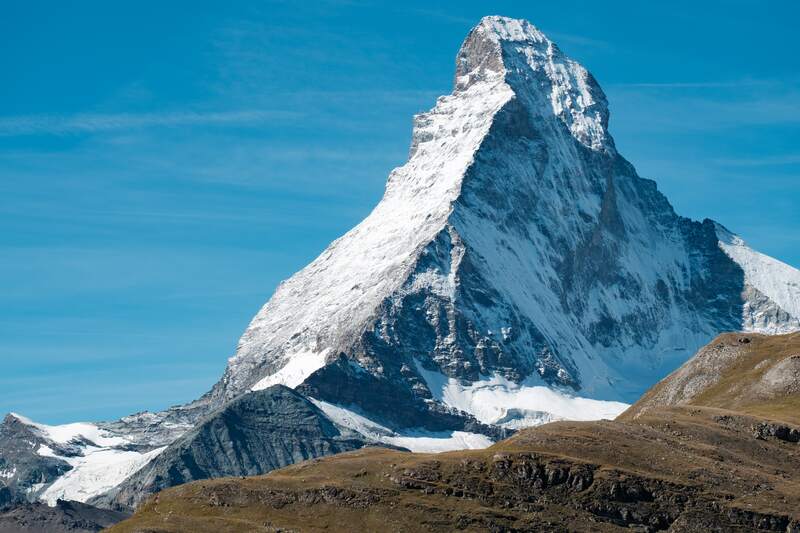 But images of the Matterhorn taken from the Riffelsee only tell half the story. 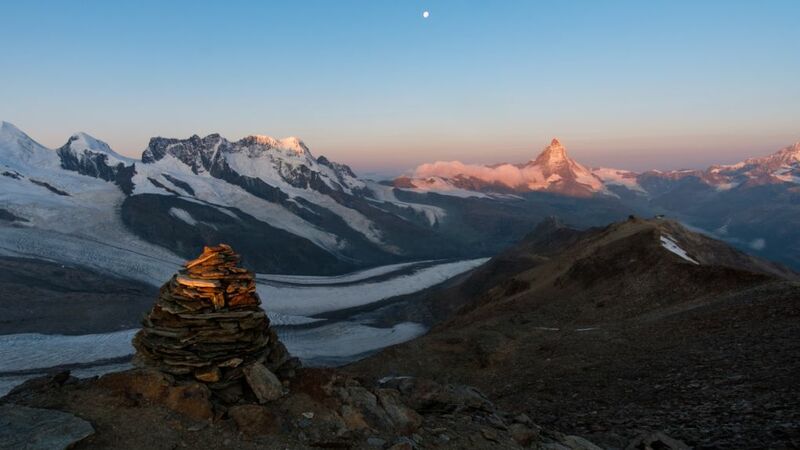 Since the 19th century, the Matterhorn has been a potent symbol: wilderness, inaccessibility, the sublime, the striving of humanity against untamed nature. Few of these themes really apply today. The mountain was first climbed in 1865, a triumph and tragedy that gripped Europe; a party of seven led by the irascible Edward Whymper reached the summit after a determined campaign lasting several years, only for all but three of them to die on the descent. It brought an end to the ‘Golden Age’ of Alpine exploration, and the legend has only grown in prominence since. 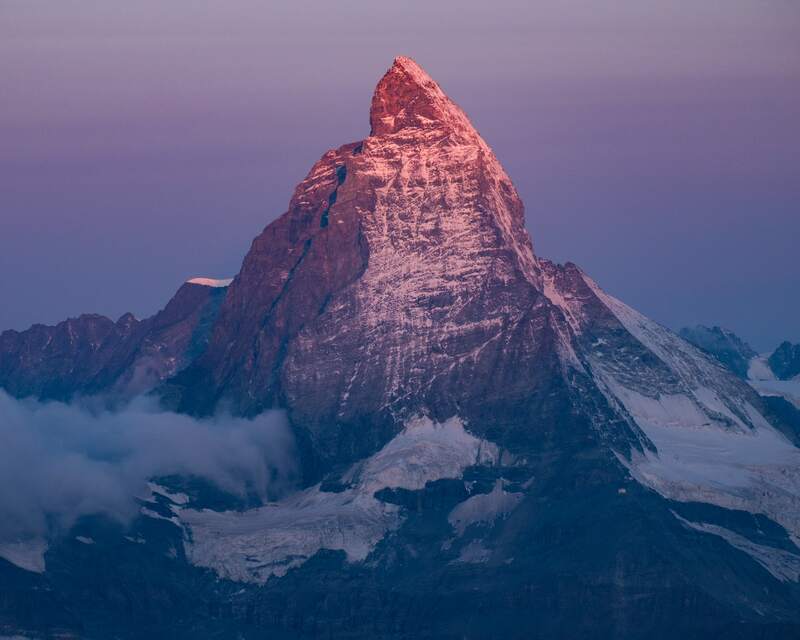 But now, the Matterhorn is one of the most-climbed mountains in Europe – still dangerous, but it’s no longer a wilderness. There’s a busy mountain hotel high on the Hörnli Ridge, steel cables and fixed ropes to assist climbers, and the possibility of helicopter rescue if it all goes wrong. Two centuries ago it was believed that the summit was a citadel inhabited by the ghosts of the damned. Now people queue to stand on the top, and I don’t believe the 19th-century concept of the sublime can be applied in the same way to this mountain now. Yet these are still the themes being expressed by almost every image of the Matterhorn. And the Matterhorn dominates Alpine imagery. I decided to take a closer look at this iconic mountain to see if I could find a more honest and less idealised perspective. The Schönbiel Hut is one of many high staffed refuges in the area, and is often used by climbers heading to Dent Blanche, Dent d’Herens, or the Matterhorn’s difficult and rarely climbed Zmutt Ridge. 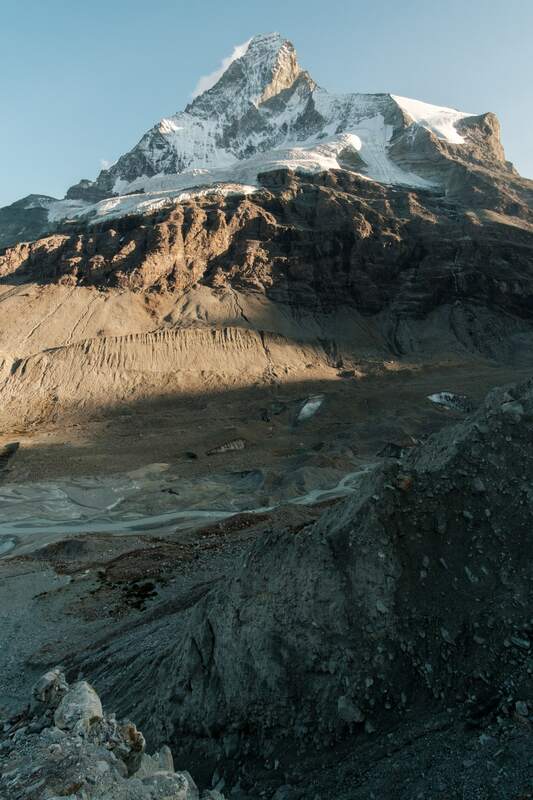 The path to reach the hut passes alongside the Zmutt Glacier directly beneath the Matterhorn’s North Face. I’d last walked this path in 2008, on my way to climb Pointe de Zinal, and had been focused on the destination rather than the walk-in. This time I kept my eyes open for image opportunities. The Matterhorn’s North Face is genuine wilderness, as untouched by humanity as anywhere in Europe – at first appearances, anyway. Look a little closer and the damage of climate change is obvious. Like most Alpine glaciers, the Zmutt is in full retreat, erosion cutting into its banks and gnawing at the Matterhorn’s roots. The hanging glacier high up on the north wall looked diminished compared to my memory of it. As I watched, the ice cliff calved a serac the size of house, which exploded on the rocks below with the sound of a bomb blast. I scanned the face with my telephoto lens. From a distance you see the gleaming snowfields, but up close it’s a tottering pile of disintegrating choss, rocks loosened by melting snow and receding ice. Everything is collapsing and decaying. 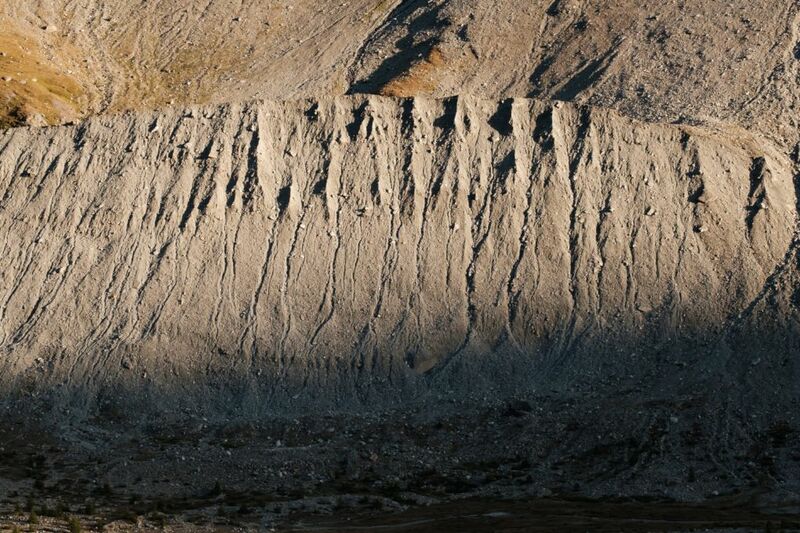 The most striking erosion could be seen on the near bank of the Zmutt Glacier. The path to the hut sticks to the crest of a long moraine ridge about 30m above the glacier’s surface. Over the previous nine years, much of this ridge had eroded and fallen down crumbling banks and gullies to the ice below. In many places the path itself had collapsed, forcing me to traverse lower down the hillside. I stood on the edge and gazed down into a chalky sea of debris being slowly transported to the mudflats at the glacier’s snout. When I reached the hut, I sat on the balcony and spent a while just watching the big mountain walls, thinking about the relationship between photography and truth. It isn’t so simple, is it? All photography is selective. Every image hides more than it reveals; every photographer makes choices about the truths he or she wishes to portray. As I looked up at those mountains, they were all things to me: huge and frightening, beautiful and picturesque, wild and sublime, eroded and crumbling, ravaged by a changing world and modified by human intent. It’s a complex picture. People want to see the wildness and the beauty in the ‘playground of Europe’; they want the charm, they want the reassurance that this place is above civilisation and all its sins. But I believe it’s time for that other truth to be told with a louder voice. These beautiful places are fragile and need our protection. When I was in the Swiss Alps in September 2017, a massive glacial collapse in the next valley prompted evacuations. A landslide the month before killed eight people. As temperatures rise, rare Alpine plants migrate to ever higher altitudes until there will be no more ground for them to colonise. The imagery of the Anthropocene can come across as harsh, ugly or unwelcome, but it’s a vital facet of the full story and it can drive change. Perhaps it’s time for the Matterhorn’s image to stop decorating chocolate boxes and start telling a tale worth listening to. Really good article. Thanks for writing it. 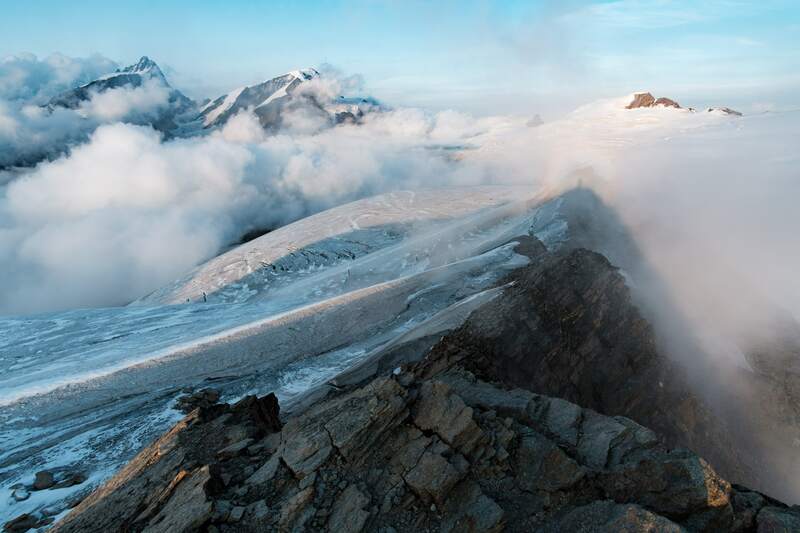 Whenever I’ve been in the Alps I’m always fascinated by the history looking back to times when there were smaller glaciers – the stories of people walking over high passes in the middle ages or Roman times, passes that even today glaciated. The Theodul pass is the one that comes to mind as a trade route in the middle ages. At lots of view points there are notices talking about how the glaciers have come and gone over the centuries. The points you make are all valid but perhaps there has been an ebb and flow of these glaciers over the centuries that we forget? Very good point, Chris. The ice comes and goes – but rarely, I suspec, this rapidly.